Two weeks ago I had been religiously checking the weather forecast – after incessant rain, there was one day that promised sunshine. Admittedly, there was more than one day that was dry but everyone was held in suspense, anxious for snow (and it did snow, becoming slush by morning). I was on a mission to make meringue: crunchy, crisp meringue that could only be worthy of praise and met with approval and always makes you reach for just one more, or at least that’s what we tell ourselves. Normally I am not so finicky about weather conditions and baking, but I was serious about getting my meringue right after reading and researching countless hours about meringue, which included writing a thousand-something-word article on the very subject and technique that took me a week to write, edit, and rewrite (and repeat). Yes, I am serious. As I wrote that article and the accompanying recipe, what I’m sharing here with you today and which was as of then simply a recipe in theory – not yet tested – I thought that perhaps I was getting ahead of myself and that I was starting to twist facts to suit my theory (or perhaps I’ve just read too much Sherlock Holmes). It took much personal effort to not write any further, especially recipe writing, until I had made the meringue myself. I had decided upon an Italian meringue, in which a hot syrup is poured into softly beaten egg whites and beaten to stiff peaks. It’s similar to making marshmallows and it is now, I believe, the best way to make meringue for those of us who don’t use refined sugar since honey in its natural state does not fold well into soft or stiff egg whites. If you’re a long-time reader of Z’s Cup of Tea, you may recall my previous meringue history that I’ve mentioned in passing: eggy, not sweet enough – a love-and-hate relationship, if you will. All shortcomings due to my false opinion that recipes were simply calling for too much sugar but it wasn’t until May of last year when I made meringue cookies with sugar – in order to get to the bottom of this then issue – and my “reconciliation with meringue” that I understood one tablespoon of honey per egg white does not cut it. Blissfully, my first batch of Italian meringue turned out perfectly, fulfilling all my expectations including what I had taken the liberty of writing about as if accomplished before, and I was pleased that I had at last mastered crunchy meringues with that light and airy interior reminiscent of sea foam – and all without a touch of refined sugar. Sometimes, I honestly don’t believe that my first-time successes (particularly those that are regarded as being more advanced and difficult such as puff pastry or poaching eggs) has anything to do with whether or not I have a natural knack for it but if I have done enough research, poring over the material so many times that I know it like the back of my hand and thus make practically no room for mistakes. I will be sharing my post on meringue next week. I will link the article in this post once it’s up. Until then, the recipe. As I will be explaining in my meringue article next week, adding water to the egg whites will increase their volume and also become frothy sooner than egg whites on their own or with the usual stabilizer suspects. The vanilla extract is important and integral to this recipe as it balances and offsets the honey’s cloying sweetness. Preheat oven to 250 to 255ºF. Line a baking sheet or cookie sheet with parchment paper. Hot syrup: Cook the honey and water, without stirring, in a small pot over medium heat until it reaches 235 to 240 degrees on a candy thermometer. Meringue: While the syrup is cooking, use a balloon whisk to beat the egg whites with the salt and water to soft peaks in a large metal or stainless steel bowl. When the syrup is done, remove from heat and immediately pour into the soft peak egg whites in a slow, steady stream while continuing to whip the egg whites at the same time. If you’re doing this by hand, at this stage it would be helpful to have someone pour the syrup in while you whip it in the egg whites. Spoon or pipe the meringue on to the prepared baking sheet and bake for 75 minutes or until light to deep golden brown and dry to the touch. 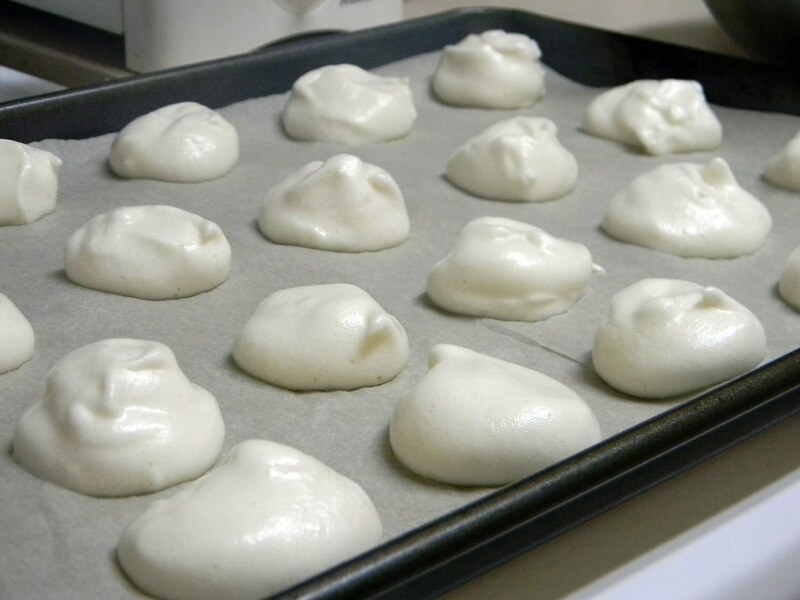 Remove meringues from oven and cool on the pan, you may hear crackling as the meringues cool and finish drying out. Peel the meringues away from the parchment paper once cool enough to touch. They should peel away easily and should sound like a ping pong ball when tapped with a fingernail. Enjoy! You are the best Zoe! I love how you write – you let us into your thoughts, experiences, etc…It’s fantastic. It reminds me of some of the articles I read in Cooks Illustrated. You’re part scientist, part artist, part baker! So awesome! Hi Maggie, thank you so much – I am at once extremely humbled and flattered at the same time. Funnily enough, a while ago on Twitter I was saying that I felt like I was writing a Cook’s Illustrated article (which was referring to the meringue article I’m posting next week, as I mentioned)! Zoe! You are my hero! 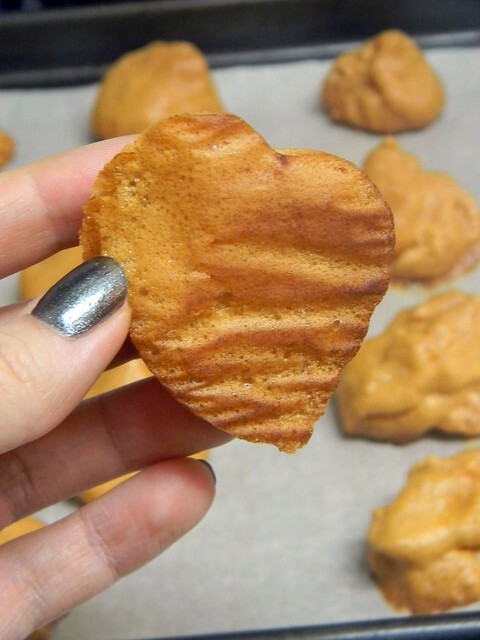 I’ve been trying for YEARS to make crispy crunchy meringue cookies with honey or agave! And what do I end up with?! Soft, very soft, ok “cookies”! Thank you soooo much! These are one of my very favorite cookies (my mom made them for us all the time growing up so I can’t wait to make them! I’m going to get my homework done and then make these for a motivation to get it done (especially since it’s so boring!) I will let you know how it goes! PS. Do you think these would work with agave??? I made these tonight with agave and they turned out awful. They were just like my previous attempts in the past…soft and gooey no matter how long you cook them they just end up burning but not hardening. Do you think it was the agave that did it? Other things that I think might have done it: I put chocolate chips in them (folded in at the end)–b/c that is how our family always does them. Do you think maybe that messed them up? Also, I had to turn up the heat a little during the syrup phase because I was afraid it would never boil or get to the right temp…maybe I shouldn’t have? Also, I accidently beat the whites till they were more stiff than soft in the beginning but I figured that that would be ok, but maybe not? Help! I was really disappointed! I made a huge batch using 4 extra-large farm eggs (although they don’t look larger than large–just the label on the box…maybe that did it too?) and use the max on everything—water and vanilla. Maybe I need to start again with a small batch, no chocolate chips, honey, etc? 😦 I was so bummed they didn’t turn out! Especially since it took me a long while in the kitchen. It’s not your fault I know…Probably too much was changed! Anyway, any suggestions would be great! Hi Ari, I don’t have agave nectar right now and haven’t made chocolate chip meringues yet (though it is my intention to do so) but I think I have a good idea of what could have gone wrong. Turning up the heat, even if slightly, could have caused the agave’s sugar structure to dissolve too quickly. Italian meringue is similar to candy making (it’s also known as boiled icing) and a rule of thumb when making candy is not to turn up the heat to speed it up or if it seems like it won’t reach the correct temperature or it’s taking too long. The sugar has to dissolve and cook slowly. When I first made the meringue I wasn’t sure either if the syrup would reach the correct temperature but it eventually did. It’s a slow but steady progression. Did you beat the egg whites with an electric mixer or by hand? I ask because it is easier to overbeat egg whites with a mixer. It would be easier to whip the hot syrup into soft peak egg whites than stiff, I think; the syrup also helps stabilize the egg whites, so that would be a contributing factor. A simple solution to remedy overbeaten egg whites (although one I have not tried) is to add 1 unbeaten egg white and beat until it reverts back to soft peaks. All of this is simply a matter of technique and also preciseness, to remember Italian meringue’s association with candy making. Adding chocolate chips wouldn’t affect the meringue’s outcome, I think, but next time when I make these meringue cookies I’ll add some chocolate chips and see what happens. When you make it again, I think going with the smaller batch would be best whether you use agave or honey and see how it goes. I am going to try them again soon using your recommendations. Just wondering, have you tried them again with chocolate chips? Also, I have since bought a Kitchenaid mixer. Should I still mix these by hand or do you think my kitchenaid mixer would work better than a handmixe? Hi Ari, I haven’t yet made the chocolate chip version! To answer your question re: Kitchen Aid versus doing it by hand, either way would work. I wrote the instructions reflecting, and from the perspective of, that I currently don’t own a stand mixer. Using a stand mixer would make the meringues faster but use the mode that feels comfortable for you and that you prefer. Just remember that if you do use a stand mixer to keep a close eye on it once it’s reached soft peaks to avoid over-beating the meringue, otherwise it will become dry rather than have stiff, glossy peaks. Good luck! In regards to your question: you could use two cookie sheets, although I don’t know the perimeters of your oven (the top rack takes up the majority?). Waiting until the first batch is done to do the second is also fine. As for sweetness, the meringues taste the same whether you use more or less egg whites since the egg whites’ original volume is expanded. Wow, yours are so much more involved then the ones that I make (posted on whatcanyoueatblog.blogspot.com)! Ill have to try your way next. Hi Lizzy, Italian meringue is a more involved than French meringue – the most common way of making meringue (adding the sugar to beaten egg whites in small increments) – and the process is similar to candy making but it’s completely worth it! It’s also the base for various frostings including buttercream. This looks lovely! Then the next step, logically, would be macarons, right? Or at the very least, a good 7-minute frosting? So glad to have stumbled on this post! Customers at our restaurant have been asking for sugar-free desserts and two years ago I did some r and d on meringue using coconut sugar but results were inconsistent. The method I used was combining coconut sugar and eggwhites in a bowl over a double boiler set up until warm and opaque before transferring to a mixer to whip them to stiff peaks. I would sometimes get meringue that I could pipe and bake into crunchy cookies but other times the meringue collapsed. So then I stopped pursuing sugar-free meringues but would love to try your method now. Thank you very much! Oh my heavens, this actually worked! 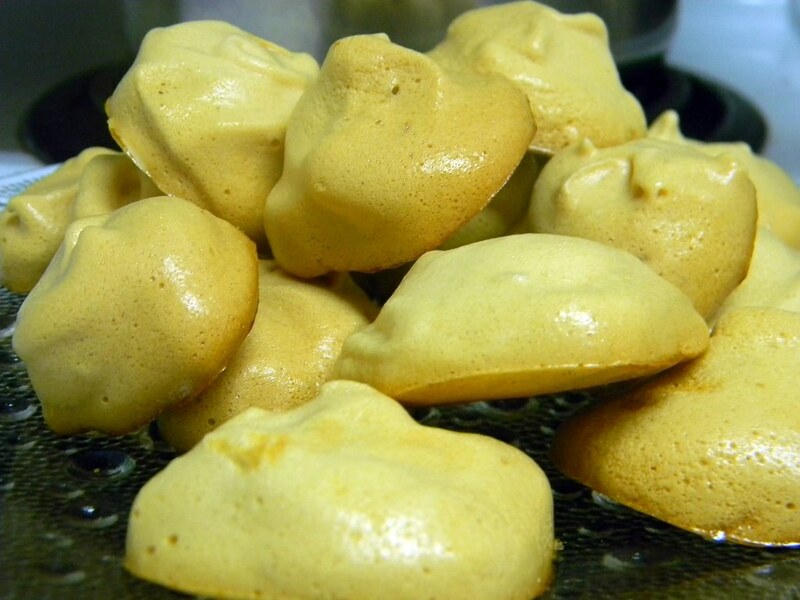 I have tried a bunch of honey-only meringues and the honey always weeps out before they are dry, or they stay gooey. I used this recipe to make meringue nests (filled with berries for our Easter morning breakfast), and they were perfect! The recipe made about 8 little meringue bowls; I baked them per the recipe, then turned the oven off and let them sit in it overnight (although it was a short overnight – turned the oven off around midnight). Even though it was raining and soggy when I made them, they came out of the oven in the morning light and airy and perfectly crispy. I will definitely make them again as little bite-sized cookies. Thank you! Hi Amber, your comment has made my morning! Thank you! I’m so pleased to hear that the recipe worked for you and I love the sound of your presentation. 🙂 That’s incredible about how it worked even despite the rain. I’m impressed! I followed recipe, and these came out great. However, taste was not great. I used 1/2 tsp vanilla. Can you suggest a way to infuse these with taste, other than chocolote chips or fruit. Use more vanilla? Another extract? Would cocoa work? Made this for my son on SCD diet, so looking for only SCD legal ingredients. Thanks. You could use more vanilla extract, or perhaps try almond extract? I’ve only made these with vanilla and sweetened them with honey, so SCD. Hope they work out for you better next time! Thank you so much for the recipe. I have been trying to make Pavlova’s with honey as the sweetener. You gave me my inspiration on the honey syrup. Course having a fab meringue recipe is just the cou! Holy cow, these are good! I made a batch today with 4 large egg whites (leftovers from making homemade egg nog), but used a little less of honey than suggested. I kept half the batch as is, and added 2 tablespoons unsweetened cocoa powder to the other half. The vanilla meringues were really crisp and tasted like honeycomb toffee! The chocolate ones were also yummy, but a little chewier (not overly surprising). Thank you for sharing such a great recipe! Really good recipe for a sugar free meringue! Thank you thank you thank you!! these did work. I had 5-6 egg whites left from making Lemon (yum!) Curd. And love meringues. Last night I made half plain, and half with broken pieces of roasted salted Pecans. Oh MG. The salted pecans!!! Beyond yum. Believe me!! Way to go.